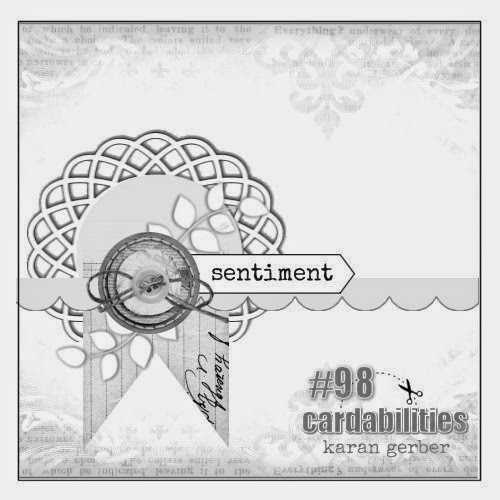 This is one of my favorite jazz standards, resonant and haunting, especially when vocals accompany the melody. I particularly love Chet Baker’s swinging, more upbeat version…have a listen while you read on. 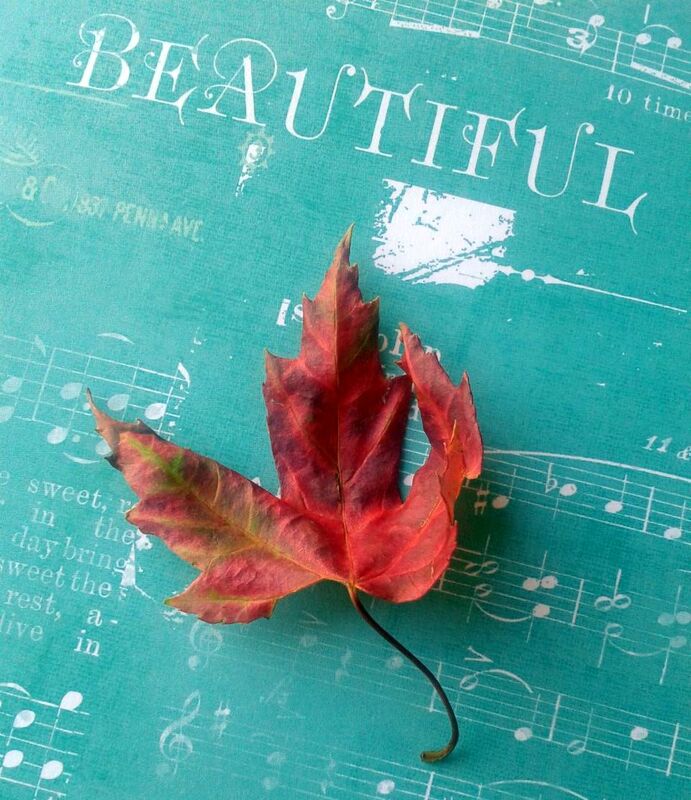 The curtain is falling fast on this current challenge, Lovely Leaves, over at Curtain Call. I had one heck of a time with the first card I created. What resulted will seem fairly simple enough; however, it took quite the process to get there. I ultimately found myself working in a sketch over at Cardabilities, so this first creation fused both challenges. I began with my focal point– that was the easy part! It was the background design that kept morphing. I definitely was not experiencing flow with this card. It’s not quite what I envisioned, nor does it pack the color punch I was aiming for, but I am somewhat satisfied with the result. For both of my cards, I used Distress Inks in Picked Raspberry, Mustard Seed, Peacock, and Marmalade to color a sheet of watercolor paper, after which I ran through numerous Impression Obsession leaf dies. I also feature the sweet Hero Arts bird. I turned to Prima for the lovely resin frame, wood leaf, and turquoise flower. In all my paper confusion, I found a scrap that had some dictionary entries on it, and I noticed the word ‘autumn’. It was likely the happiest moment in putting this card together, as an empty frame on the card was leaving me a bit empty! 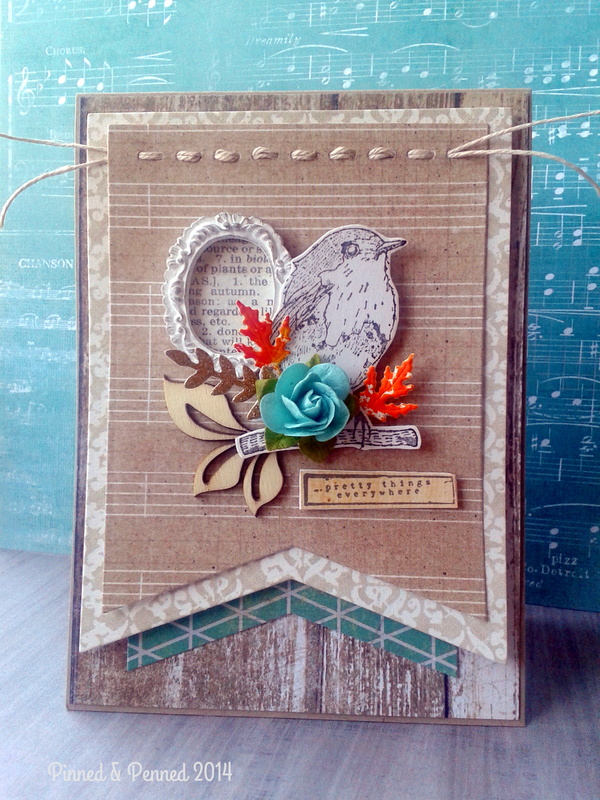 I stamped my sentiment on some woodgrain paper and layered it numerous times onto scrap paper to give it more of a wooden sign effect. Before I layered my banners, cut from MFT dies, I decided the top needed some visual interest, but nothing to overwhelm the focal point. Given the time this card took, and my being prone to error throughout the process, I didn’t really have it in me to sew along the top, and I wanted a really clean feel anyway. So I die cut the holes using a PTI die, then threaded through some hemp twine. The inside and back are finished off with a strip of Crate Paper’s DIY Shop adhesive paper. 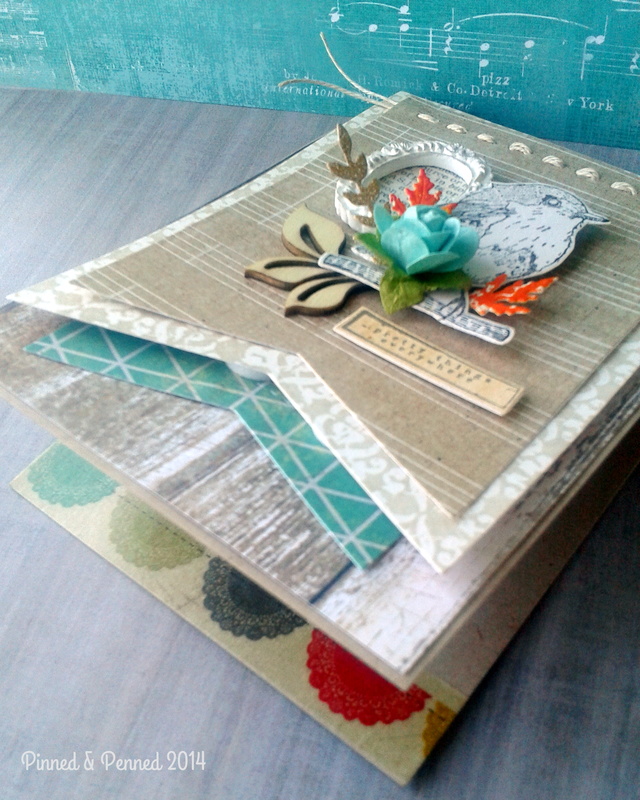 The green paper and the woodgrain are also from DIY Shop. Pieces of this card were strewn about for days, only finally coalescing today. I didn’t even think I would pull a second card together, but I needed a break from work, and figured playing with some paper would be a good escape. I wanted more of a bright, neon pop with this card. 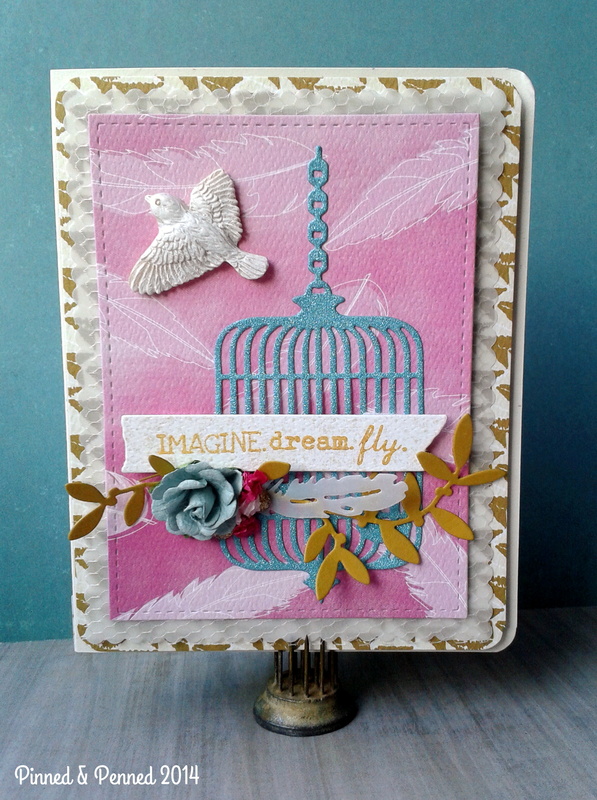 I maintained the grey of the inspiration photo in the background using both Grout Grey from MFT and Rock Candy from Bazzill, which has that wonderful nubby texture. The Grout Grey layer was stamped with Grout Grey ink using an Amuse Studio background stamp, the dictionary definition of ‘extraordinary’. I used another background stamp from Hero Arts for my first panel. I wanted some texture in this card, so I used watercolor paper with my Fresh Ink in Mustard. The wooden clock from Prima was an after-thought that seemed to pull the focal elements together. I love how the color and sentiment of the Basic Grey plastic embellishment from Grand Bazaar fit within the overall scheme of the card. The resin flower is also from Grand Bazaar. I added my die-cut Penny Black sprigs for some interest, but went with clear vellum as to not overwhelm the bold focal point. 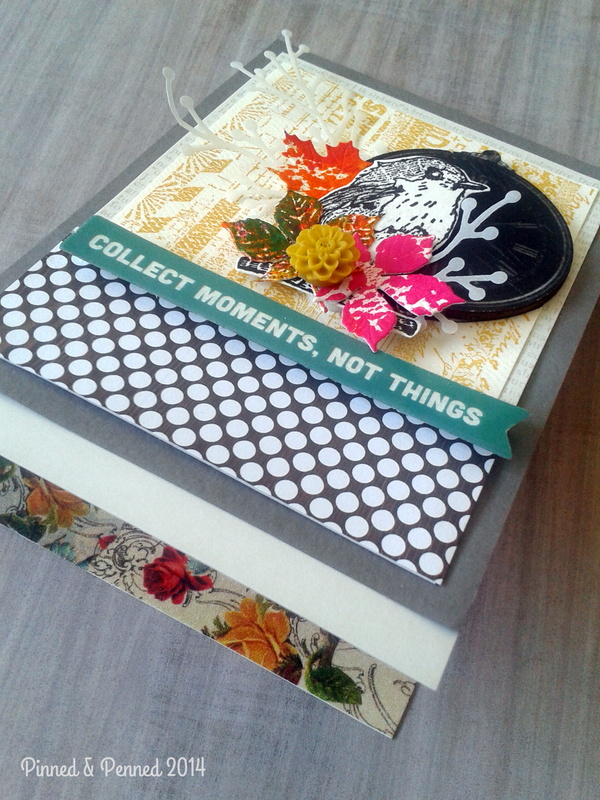 The inside and back are finished off with some floral and fauna washi. 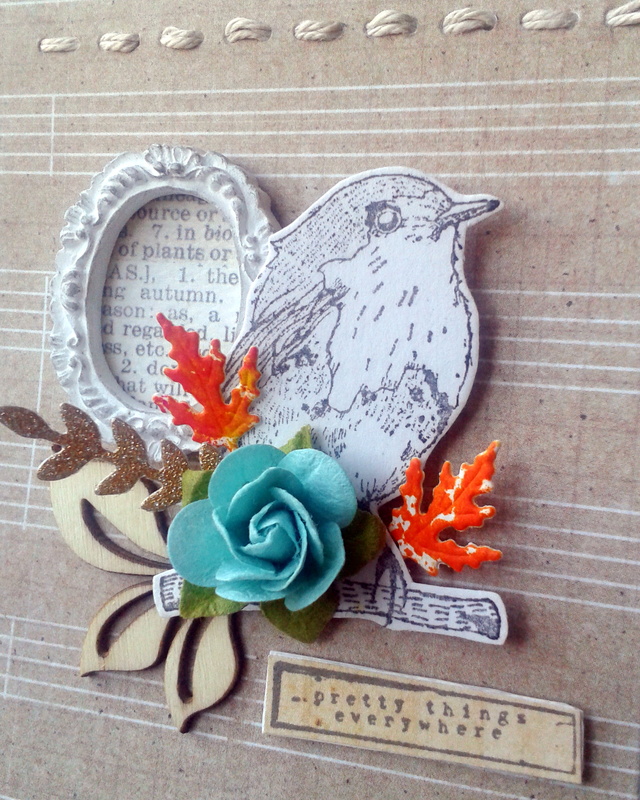 Prior to making these cards, I found the first leaf drop of the season last week. He lay there lonely on the sidewalk, so I scooped him up and brought him home. A bit crunchy now, but still beautiful! That’s it for me this evening! Thanks for stopping by. And make sure to check out the gorgeous leaf creations at Curtain Call. They really are show-stopping! Right now the evening sky is the pink-blue-gold of my card, featured below, and I am happy to say that the sun is setting on an incredibly productive day spent creating. With the exception of a few fine hours spent with the PNW Crafting crew a couple weeks ago, such a day I have not seen in my own studio since June. This summer has been replete with work and visitors, both of which I have been happy for, but I have yearned for a whole day free to play with paper and ink! 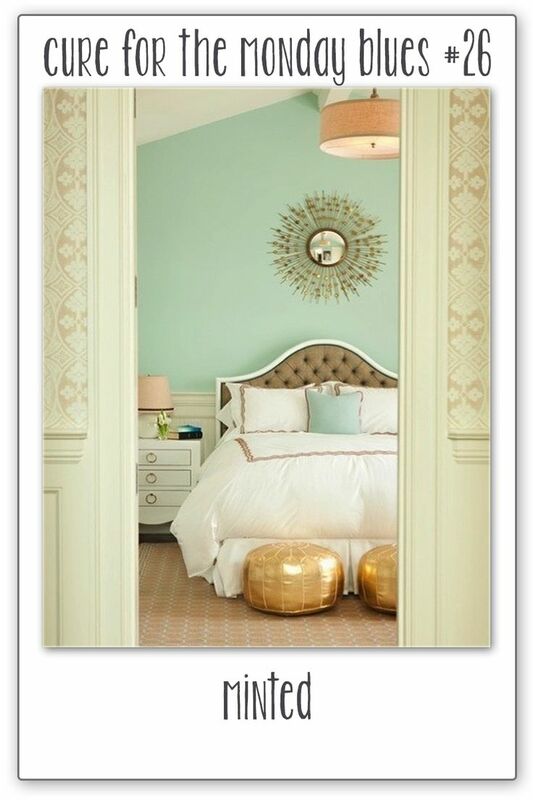 I love these colors–the gold and mint combination is divine! 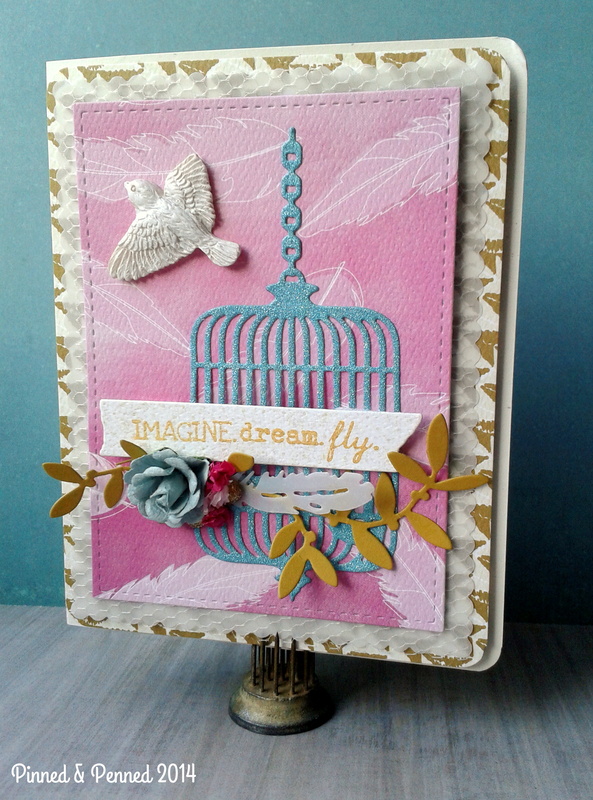 I pulled in a similar design as the wallpaper for my background, and featured the pink of the lampshade a bit more prominently, as I wanted to work with a bird theme and the Wildflower feather paper was perfect. 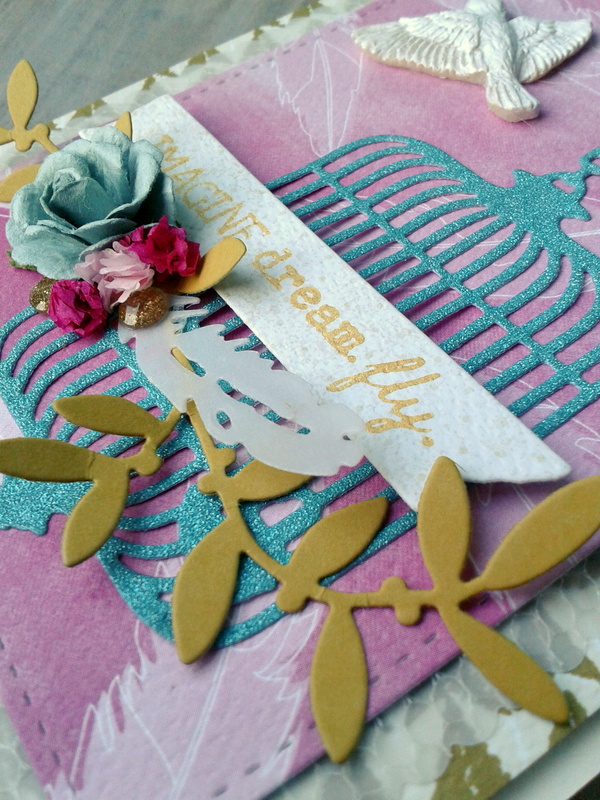 I love all the textures in this card–from the feather and glitter papers to the paper flowers and netting. The Wildflower papers are so luxuriously thick and textured, to say nothing of the graphics! 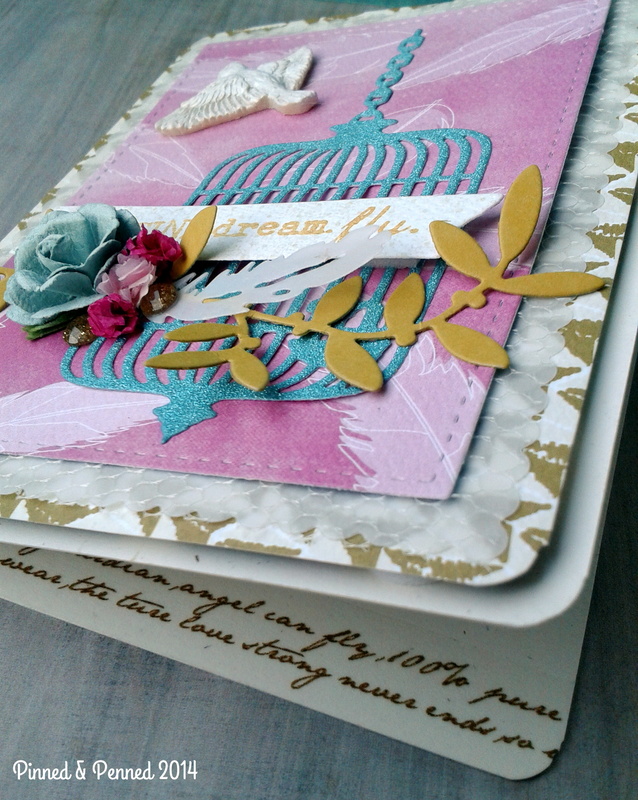 I have featured the feather and the gold arrow papers from the collection, as well as PTI’s heavy vellum and MFT’s Primitive Ivory for the card body. 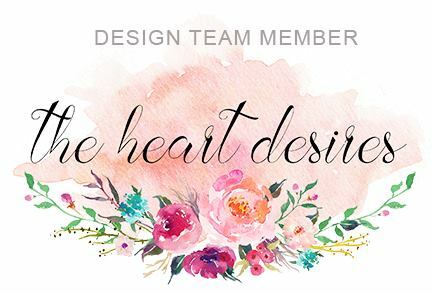 You may recognize Mama Elephant’s Femme Frame dies; Ellen Hutson has a great set that includes these, as well as the Dainty bow, Embellished Tag, and Bold banner. The inside and back are finished with some of my favorite washi tape. My little cluster of goodies atop the Impression Obsession birdcage features a variety of products. 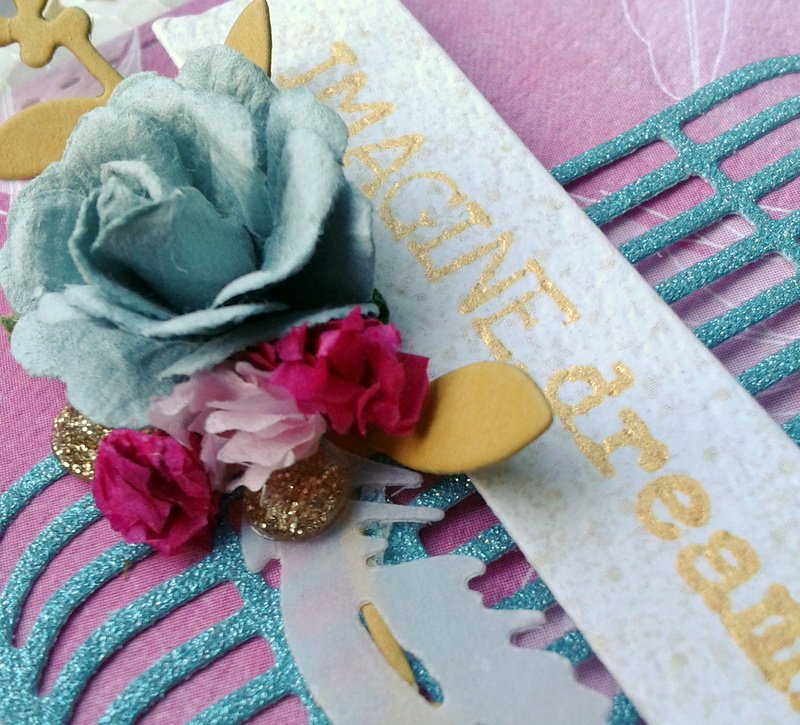 The blue flower and gold dots are from Prima, along with the resin bird, but I die cut and rolled the little tissue paper flowers from Impression Obsession’s mini spiral flower dies. The Unity Stamp Co. sentiment has been stamped in Brilliance Rocket gold ink onto a lightly swiss-dotted paper die cut from MFT’s washi dies. 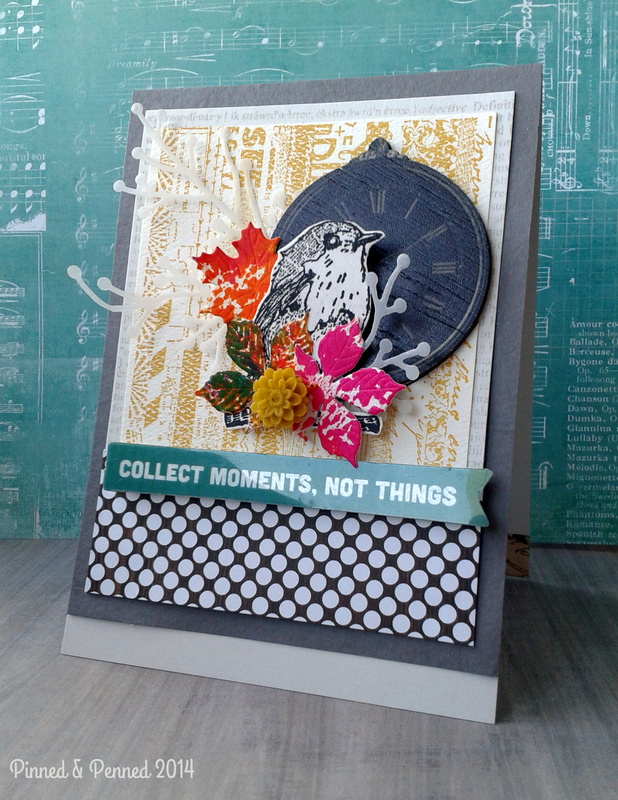 I used Penny Black dies for the feather, cut from PTI heavy vellum, and deconstructed Dancing Leaves in MFT’s Fuse green, which is a new favorite color of mine! Thanks so much for stopping by! I hope I sparked your imagination. Make sure to check out Taheerah’s Cure for the Monday Blues challenge; a new one posts every Monday! Check back tomorrow for a CASE Study card to celebrate their 4-year anniversary party! The sun is streaming into my office-studio, which is a wonderful thing after a weekend of torrential downpours! I have to admit, though, after a very busy week, I felt fine embracing some rainy day laziness. Don’t you love warm, darkening days when the rain pelts the roof and you can just lie there listening? So I did a little bit of nothing and a little bit of something this weekend, which resulted in the card below and the one featured in my following post! I’ve recently been following Cardabilities, discovered through Pinterest and some international card artists. I really like the sketches, and found that working from a pattern that is multi-layered and more complex was really helpful in my design process. You can find more awesome sketches on my Pinterest board. As I have mentioned in previous posts, I struggle with visualizing and engineering designs in terms of perspective, proportions, and layout. I may see what I want but I have to do it, playing with the elements, in order to figure out how to make it work. I use models and modeling in my teaching all the time– I guess it’s about time I practice what I preach to help me improve my visual art! So I have been studying a bit of design theory, as well, and recently purchased Lisa Dickinson’s Design Workshop from Ella Publishing. I am tired of looking at a piece knowing instinctually that something is wrong, but not knowing how to fix it, and thus spending a long time thinking and tinkering before I get it right. Hopefully having some grounding in the language and theory will help my designs and make the process more expedient! I just have to mention before discussing the details of the card, that on Easter we went to a large outdoor Sunday flea/farmers market in Fremont, which is always so much fun, especially if it is not raining! Thanks to Laura Davis over at The Paper Poppy (and queen of amazing bows!!! ), I finally figured out that the bed of nails on which my card is resting is called a “frog”. Frogs were used for floral arranging and come in all kinds of shapes, designs and colors. I found this gorgeous green one, and a tiny one inch ivory one! Laura typically features them with her lovely cards and I had been trying to figure out what they heck they were after seeing them all over the place and asking people who didn’t know either! Luckily Laura did! By the way, she has a new challenge out–Poppy Sketches! Okay, on with the card. I am really happy with how this turned out in terms of pattern, flow, repetition, contrasting elements, and colors! All of the patterned papers are from a discount pack, so I don’t know the manufacturer, though I think some are from Crate. One of the double-sided papers has different tags on one side that I just love! 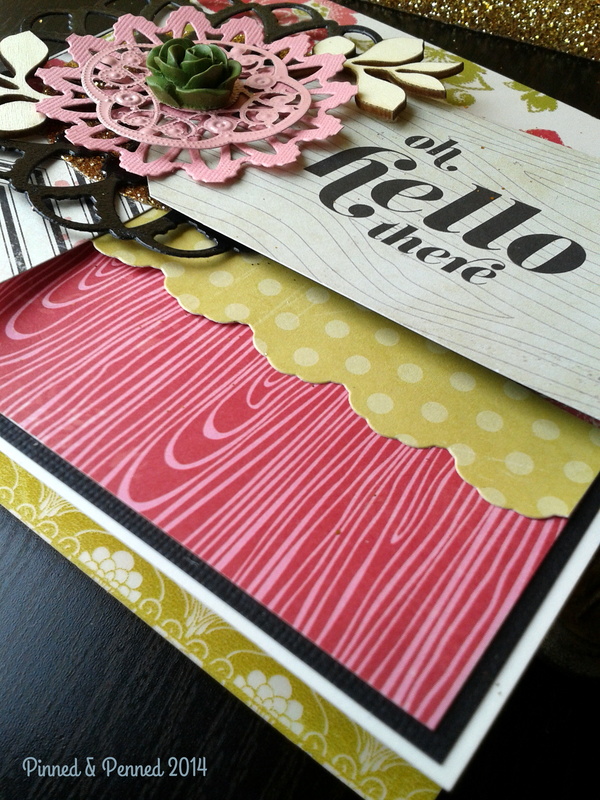 I was really excited to use this particular tag and love how the woodgrain echoes the neon pink woodgrain of the bottom panel. The inside and back are finished with Prima Welcome to Paris washi in that amazing wasabi green! In the detail photos you can see some of the texture I incorporated. 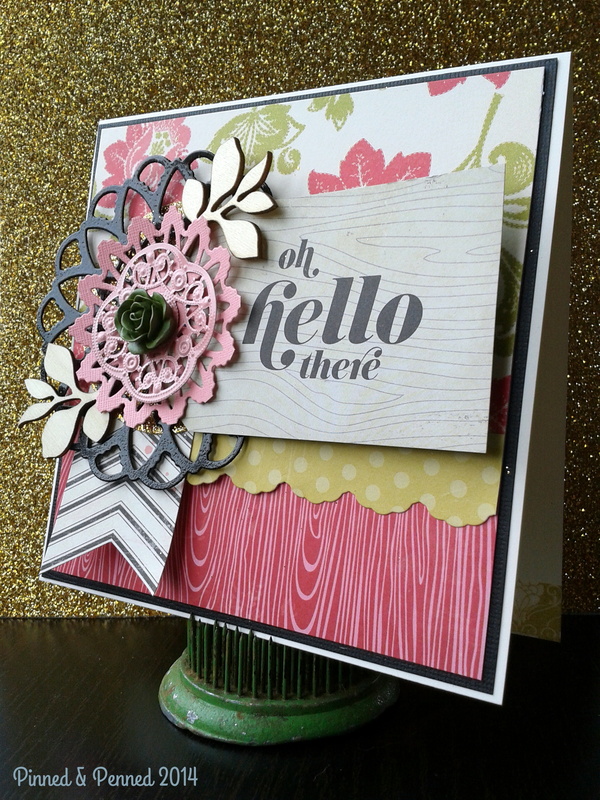 I die cut my Hero Arts Fancy Floral Die in Bazzill black, embossed it with Versafine Dazzle and clear powder and heat set for a glossy finish. 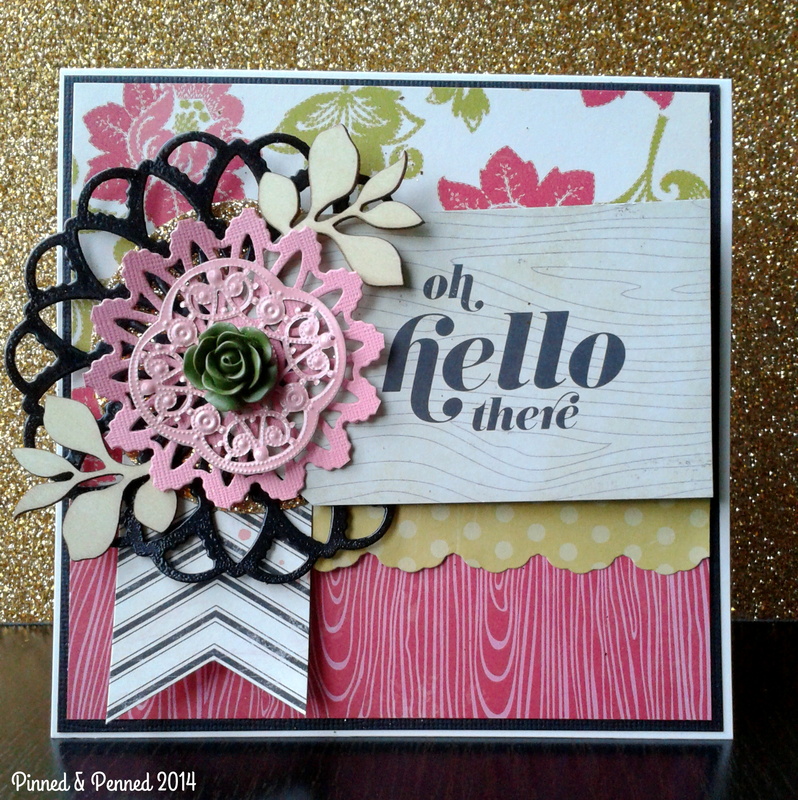 The pink paper wheel is actually cut from the same die– I just cut out the center! 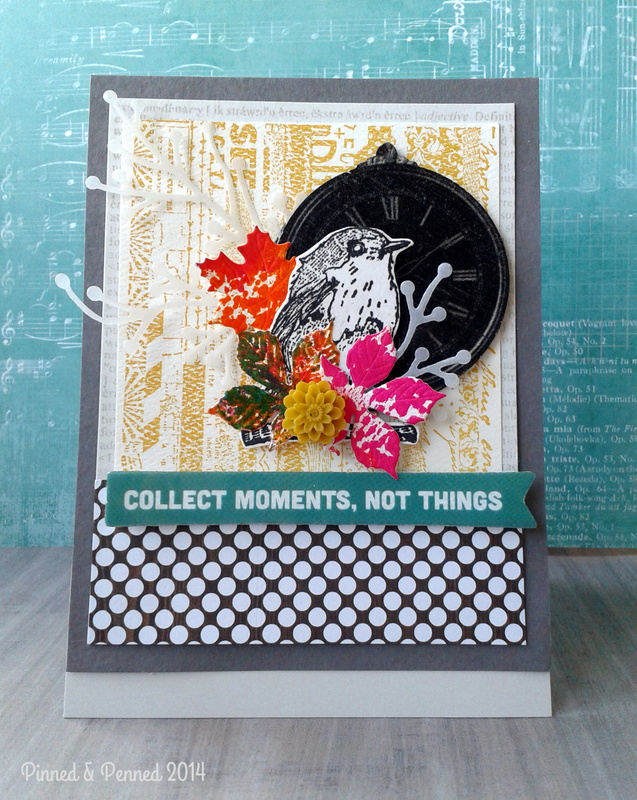 Double-timing die– love it! 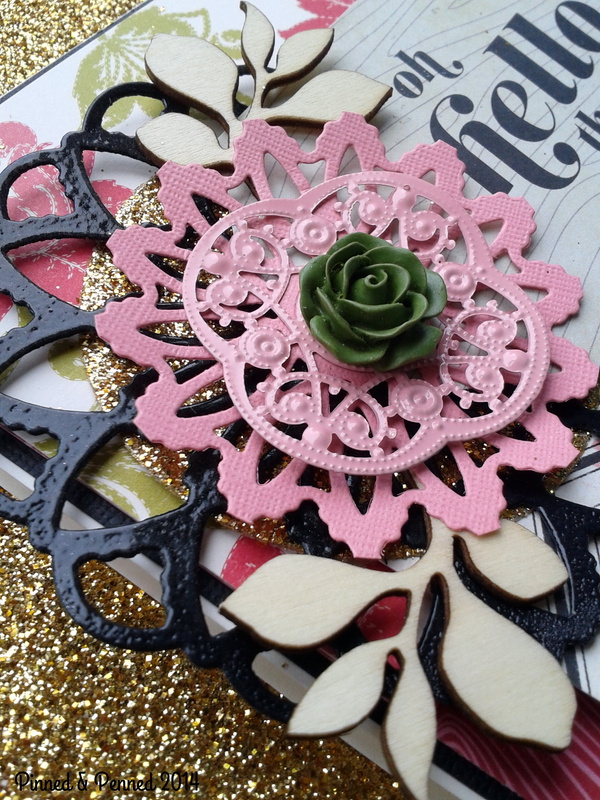 The pink metal embellishment is from Basic Grey’s Spice Market pack. I finished off the cluster with some Prima wood leaves and Fancy Pants resin flower. 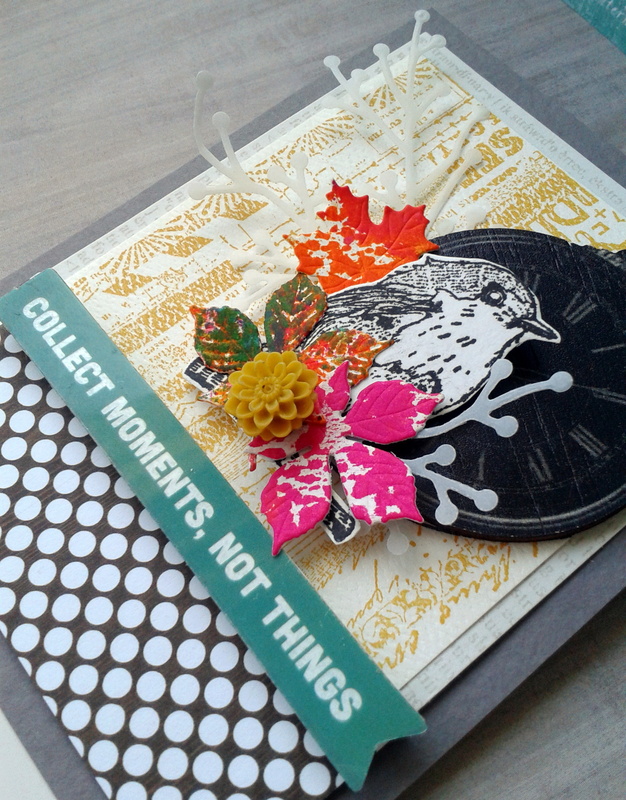 Finally, my little wasabi polka dot strip was a scrap cut from the edge of Spellbinders Floral Ribbon Threader die– which has so many uses. Love all that gold? I found these adhesive 8 1/2 x 11″ sheets by DuoTone at Joann’s. They are awesome! So this card is headed over to Cardabilities as well as Curtain Call, whose theme this week is Pretty and Pink (I wanted to write “Pretty in Pink” Ahh, Molly Ringwald!). I think this card fits the bill! Check out both challenges for some very pretty cards! 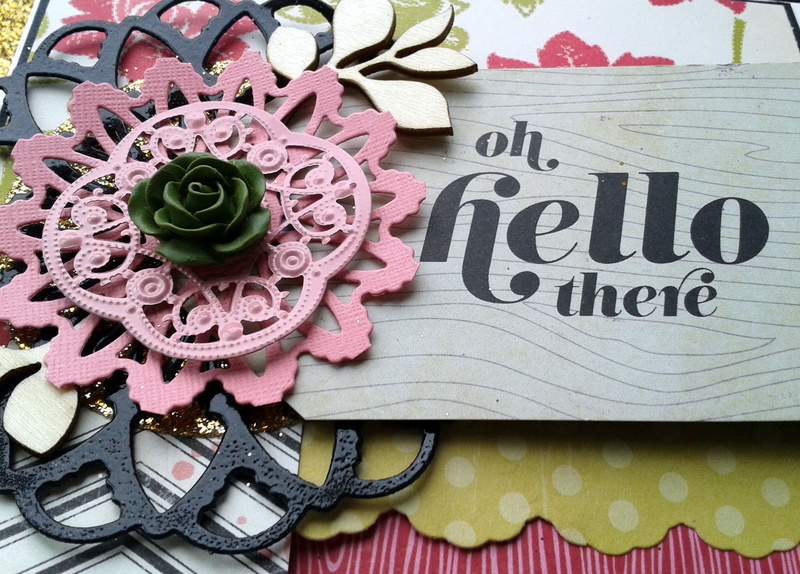 Please check out my second post of the day for more pink prettiness! Hope you are off to a great week!